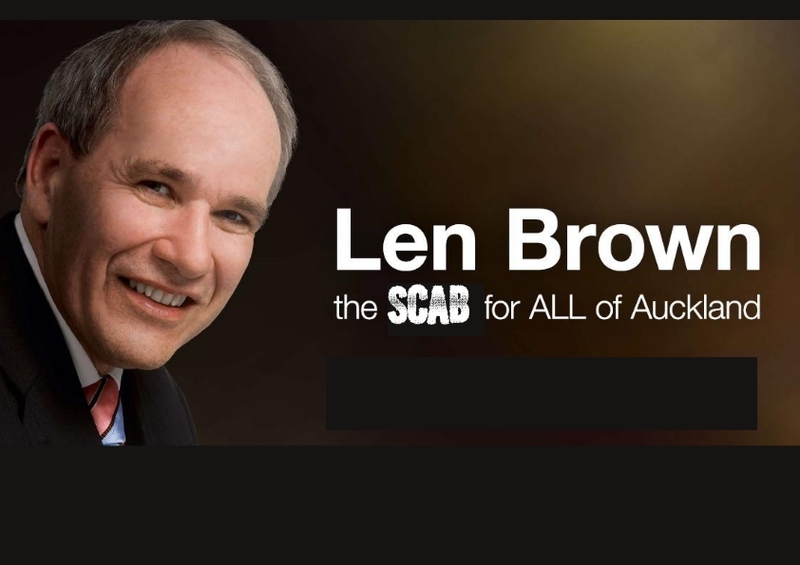 Let's give Len his dues and give him his single line of defense before pointing out what a scab mayor he has become. The drive to crush the Union was all generated within one of those joke Council Controlled Organistaions created by Rodney Hide to ease with the chopping up of Aucklands assets and to hock them off, if John Banks had won as Mayor. We all bitched at the time that these CCO's were a farce because the majority were right wing yes men appointed by Hide. We all argued that these CCO's weren't controlled by Council and that they were powers unto themselves who did all they could to shroud their business in secrecy away from the oversight of ratepayers and the citizens of Auckland. This mass sacking and manufactured crises at the Waterfront shows how well founded those concerns with CCO's were. This has come from the bowels of the old boys Auckland mafia network deeply ensconced within the Waterfront CCO. The lies that this was about pay were seeded on the right wing blogs and regurgitated by underfunded news rooms. Real productivity gains would be from targeting the fees set by the shipping lines, not crushing Unions on the waterfront. This isn't about economics, this is about ideology. So this isn't Len's creation, design or suggestion. 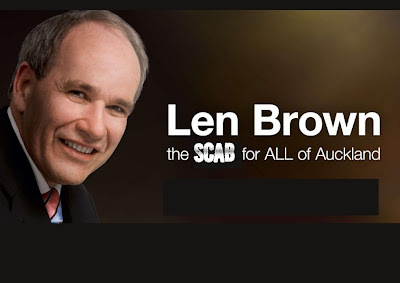 But that's all one can say in defense of Len Brown's magical 'journey' into big money Vunderland because he could sack board members until he gets what he wants. He could fight and make public statements that he was voted in by the workers of Auckland and he won't have assets squeezed to gain a criminal 12% return. He has power to lead and he is choosing not to. He is either choosing not to because he is poorly advised or he is choosing not to because he's in on the take. I have complained bitterly to the highest levels of the Council left that the Mayors office required far better adviser capacity as a series of mis steps so far had left me concerned that Len wasn't getting well thought out political advice, (Shearer is suffering the same fate with an even more shallow advice pool). The RWC opening night fiasco, his kneecapping by Murray McCully, his lackluster support of heritage preservation, the constant blocking of his transport desires, the inability to articulate the importance for Auckland to lift the economic stress while Christchurch is off line thus needing vastly more investment. On all these fronts Len seemed lead footed and poorly advised, but his capitulation with PoA seems to go beyond ignorance to capitulation. It will reap a bitter harvest for Brown. The economic ramifications at stake here are dire for Auckland. The internationalization of this issue means Auckland will be blacklisted as a port. The Australian and American Union websites have this issue on their front pages, Tony Gibson has bitten off far more than he can chew and he's endangered the entire country's economic growth. The impacts of this will have immediate, medium and long term negative economic implications, all of which spells doom for any second term Brown may of envisioned. This manufactured crises has mutilated our Port, the protest against this self sabotage is this Saturday, 4pm Britomart. Is Brown getting poor advice? Or is he ignoring good advice? Brown is just the latest in a long line of Labour politicians who run from the trenches whenever a real fight starts. We shouldn't rely on politicians to do anything for us anyway. They almost never have and probably never will.